In April 2018, three African universities organised Open Days, during which they set up Breakout Sessions attended by specialised focus groups. 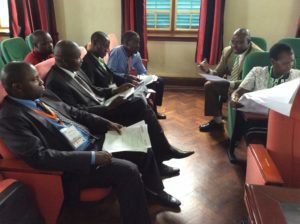 Uganda’s Makarere University, which celebrated its Open Day on 12 April, set up four focus groups; Maseno University in Kenya (27 April) set up three, and the Open University of Tanzania (19 April) organised five. All of the sessions involved an average of twenty people per institution, as well as trainers, potential employers, and aspiring employees. The Open Days were a venue for the dissemination of information about EPICA, a new strategic partnership between Europe and Africa for the co-design of an innovative and scalable ePortfolio, developed by MyDocumenta, as well as other targets. They sought to raise awareness of the project’s main goals in the local communities. Beyond this, the Open Days were designed as an opportunity to gain insights into the skills gap that hinder the professional chances of recent graduates in the African partner countries. Unfortunately, there are still a significant number of university curricula that do not address the development of competencies for the marketplace directly or explicitly. This results in a shortage of professional profiles that are prepared for the labour market and, consequently, contributes to the high unemployment rate. In this regard, one of the EPICA’s goals is to detect from the very beginning what the needs of future employers are in regard to graduates’ skills, and to support universities and students in making them visible and creating appropriate actionable policies. Discussions and debates with representatives of companies from various sectors, as well as targeted analysis of the employers’ needs, are foreseen throughout the entire project. Breakout Sessions were organized within the Open Days that addressed key stakeholders - organised into focus groups - from the scientific and education community, the business community, and the public sector. Their main task was collecting information on the demands of businesses, industry groups, and potential employers with regard to the skills and knowledge that are relevant for African graduates in their search for employment. Besides the analysis of supply and demand of new graduates’ employability skills in sub-Saharan Africa, the sessions were also geared toward detecting the main reasons for the skills gap (level of co-operation between education and private sector, policies, recruitment processes, connections, etc.) and identifying solutions to help enhance students’ employability skills. Concrete actions that need to be undertaken in the local context to reduce skills shortages were also scrutinised, together with new proposals (from academics, employers, graduates and students) on how to equip learners for the marketplace while they are still in the educational system. During the Breakout Sessions, groups of around eight participants were created, and a moderator, equipped with a protocol elaborated by Spain’s Open University of Catalonia (UOC), was assigned to each group to guide the discussion. The duration of the sessions was about an hour. The main questions addressed to the participants focused on the skills required or valued by employers in the current and future African labour market. Information was also sought about their personal perceptions of recent graduates’ readiness for entering the labour market; new graduates’ skills deficits; the process of recruitment of recent graduates; local initiatives undertaken to foster employability among stakeholders; and new proposals to ensure better alignment of the students’ skills with the needs of business and industry. The Focus groups’ discussions were in English. Recordings of the sessions, collected by UOC for analysis, are providing valuable information for the project’s development. The results elaborated on the basis of the outputs of the various sessions will be available in July.